The Richard T. Clark Fellowship is a Merck based program which gives employees an opportunity to work for 3 months periods, directly with non-governmental organizations around the world. 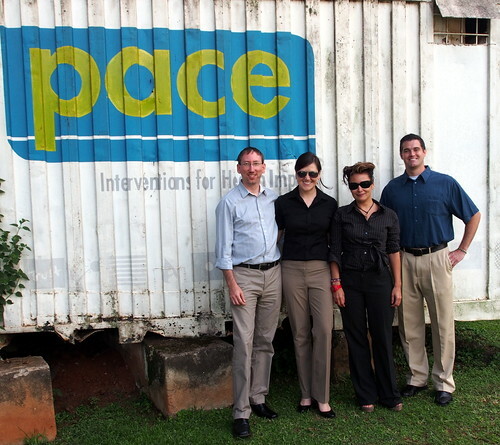 In August of 2013 I applied and was accepted into the program, and will be working with the Uganda based PACE organization over the three months from October through December. Along with three Merck colleagues I'll be focused on operationalizing a 'franchise-in-a-box' business model, and creating a strategic IT plan for the organization. Over the coming months I'll be posting my personal experience in working with an NGO, and my experience living in Kampala, Uganda. Sometimes Google seems a little more human than you'd expect. 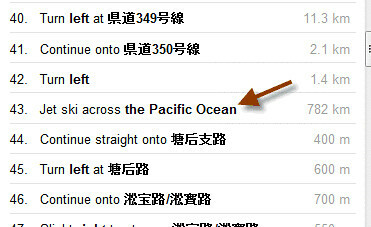 Searching for directions from Japan to China for example reveals the wonderful direction #43... "Jet ski across the Pacific Ocean, 782 km". Along with quad-copters, flying drones are the the closest thing we have to SkyNet. This takes things to a new level, with flying-bots that control their own altitude, airspeed, and turn rate based on remote guidance. Goto Japan with a Canon EOS 7D. Take a video. Edit. Stunningly emotional output, by Matthew Brown. Check out his other work as well -- also very good. ImprovEverywhere organize theatric performances. Staged in completely public areas. So at any moment, in the street out in public, a performance might take place. This one, is on a subway; and it's a scene from Star Wars; and it's epic. Obviously, well planned (except when it turns out Vader is too tall to fit through the door and smacks his head! ), with renting costumes, planning subway stops, and script timing. The looks on peoples faces watching the performance unfold is a joy, especially the kids. That and the number of cameras that get pulled out -- everyone has a camera. Of course, they do multiple performances over the course of a few hours, to get full use of all that planning. Also check out Frozen in Grand Central. Excellent job guys! If this wasn't so close to how much of the public actually sees BP's response to the Gulf of Mexico oil disaster, it would be even more hilarious. That and recent news that the camera robot knocked the 'funnel' from the gusher makes this comedy even blacker. 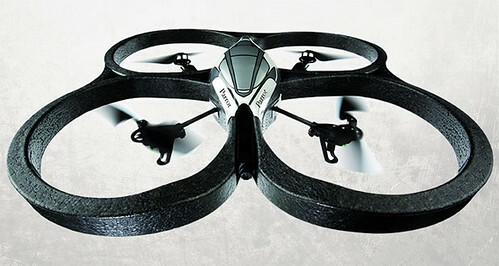 Remote control helicopters are awesome (check out Alan Szabo for reasons why), but not new. Quad-copters, controlled via an iPhone are new and awesome. The AR Drone has four fans, providing a high level of stability, and controllability. It's able to hover in place, and is maneuvers well enough that you can play augmented reality games using the copter as one of the participants in the game, fighting computer generated opponents. Plus it has cameras. One at the front, and one towards the back facing down. Video can be streamed real-time back to the controlling phone. As well as appearing in Guetemala, sinkholes are also ocean-bound. Dean's Blue Hole is the second deepest underwater hole, at 663 feet. Guillaume Nery is a freediver, a water based equivalent of a basejumper. He jumps into underwater sinkholes with no breathing apparatus, other than his lungs. This is him jumping into Dean's Blue Hole. The video is heavily edited. He doesn't actually get to the bottom. But it's freaky. Awesomely freaky. Believe it or not, this image is not photo-shopped. 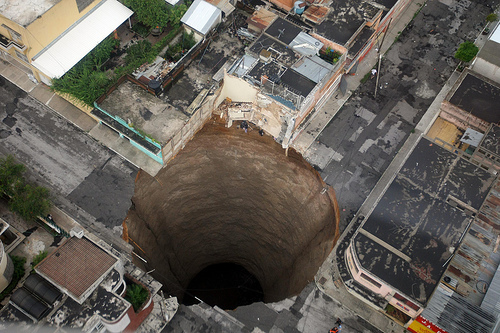 Reported today, a large sink hole suddenly appeared in Guatemala City, after a tragic tropical rainstorm. Update: Now with some overhead helicopter action video. The appearance of sink holes is not uncommon in Guatemala, and are usually a few hundred feet deep.